Irish PMI for June, released earlier this month by Markit (co-branded by Investec) give us a chance to look at quarterly activity. Given volatility in both Manufacturing and Services activity in the monthly data, this provides a slightly better potential insight into what is going on in the economy (see caveat at the bottom of the post). Q2 2015 average PMI for Manufacturing sector reads 55.8 - the lowest for any quarter since Q2 2014, but still solidly in an expansion range. Q2 2015 marks second consecutive quarter of declining manufacturing PMI readings. However, on a positive side, Q2 2015 was the 8th consecutive quarter of readings above 50. Year on year, growth in the sector remained largely unchanged and growth de-accelerated on a quarterly basis. Q2 2015 average PMI for Services rose marginally to 61.8 from 61.6 in 1Q 2015 and is below 62.1 average for Q2 2014. Q2 2015 marks 18th consecutive quarterly reading above 50 for the Services sector. Year on year, growth slowed down in the Services sector and quarter on quarter it remained largely static. Construction sector PMI (co-branded with Ulster Bank) posted quarterly average of 60.3 in Q2 2015, well above 54.0 average for Q1 2015, but below 61.2 average for Q2 2014. Thus, year on year growth fell in the Construction sector, but there was a significant acceleration in quarter on quarter growth. Q2 2015 marks 8th consecutive quarter with average PMI above 50.0. Composite PMI (subject to future revisions due to sectoral weights changes once we have Q1 and Q2 national accounts) posted a reading of 60.4 in Q2 2015, up on 59.0 in Q1 2015 and marginally higher than 60.2 reading in Q2 2014. Year on year, composite PMI signalled basically static performance, while quarterly growth improved somewhat in Q2 2015. 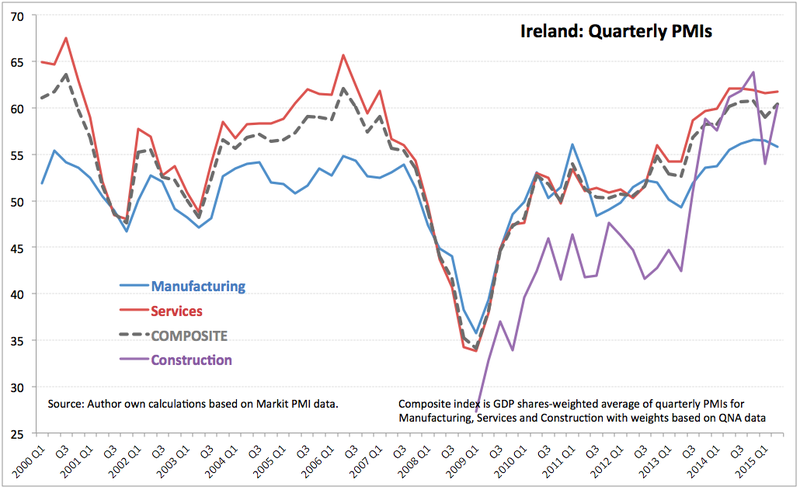 Caveat: Irish PMI readings have very low direct correlation to actual growth in the economy, measured by either GDP or GNP. Historically, PMIs levels and changes explain at most ca 10.6 percent of variations in GNP and at most 8.8 percent of variations in GDP. In other words, booming PMIs, on average, do not translate into booming economy.